A mixed team of seven Penn State undergraduates — one in the College of Arts and Architecture and six from the College of Engineering — received $30,000 to continue development of an application to help students figure out the shortest path to graduation. "LionPlanner" won first place in a competition that challenged students to use artificial intelligence to solve real problems. 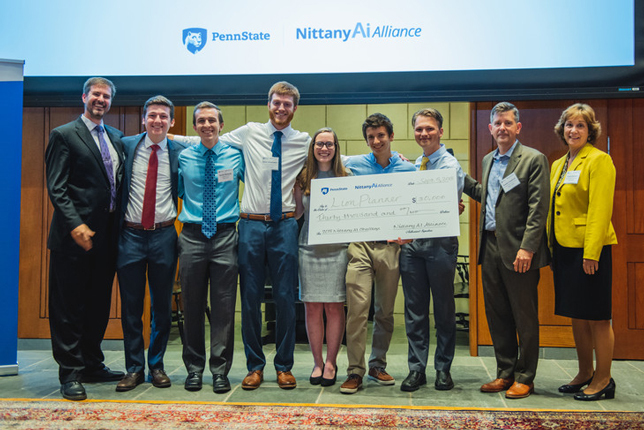 The multi-phase contest was put on by the Nittany AI Alliance, a group of faculty and companies working together to give students opportunities to learn more about AI. The LionPlanner team used machine learning, natural language processing and other algorithms to identify an optimized track of courses for students based on their career interests. The program exports results to help advisers work with students in academic planning and to push students to plan ahead to meet their degree requirements. The natural language processing approach was term frequency-inverse document frequency (TF-IDF), an information retrieval and text mining technique that measures how important a word is in a document. "We've each experienced the complicated and tedious process of academic planning, and currently there isn't a really good or easy way to plan more than one semester at a time," the team reported. "Using TF-IDF, LionPlanner helps students plan their entire experience at Penn State, allowing deeper insights when they meet with their advisers. With LionPlanner results in hand, advisers will have more time to help students learn about opportunities at Penn State to develop an academic plan that works best for their individual circumstances." "LionPlanner was selected to receive the most funding due to the widespread and immediate impact that the product can make on the student experience and its potential to create efficiencies that would enable advisers to utilize their time with more students to focus on strategic conversations," said Tracey Huston, vice president for Penn State Outreach and member of both the award and review committees, in a statement. "The pitch and product generated enthusiastic support among the reviewers and judges for these reasons." Use of AI in the product to solve a problem, advance a solution and/or improve a current service. During phase one of the competition, 10 projects received $2,500 in seed money for development of a prototype. In the second phase, teams representing five prototypes received $5,000 for further development of a "minimum viable product." This latest phase was the third and final one. Two other teams each received $10,000 to continue development of their solutions. "Aspire" helps students map college careers to gain new experiences and skills that will lead to their dream jobs after graduation; and "ProFound," described as a "professor search engine," allows students to retrieve publicly available information about a faculty member. The 2019 Nittany AI Challenge will begin in January 2019, following a November "ideation" session to be held during Global Entrepreneurship Week at the university.